The complete New Ace English-Korean Dictionary • published by Kumsung Publishing, one of the Korea's leading dictionary makers • 310,000 words, meanings and examples • Thousands of notes on grammar and ways to use words • No internet connection needed. 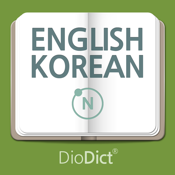 **Free upgrade available for Diodict 3.5 ENG-KOR Dictionary users. • The trusted New Ace Korean-English dictionary is used by Oxford University Press, the world's largest university press! • Continuous updates from Harper Collins' 'New Words' database! • Updated under the supervision of domestic and foreign language institutions and Jeong Yeongguk and Jo Miok, the most respected lexicographers in Korea. • Entries focus on practicality and frequency of use. • A wide range of lexicon including a select 215,000 English-Korean and 95,000 Korean-English entries. • Two way English-Korean dictionary suited to learners of both English and Korean. • Updated to cover the latest vocabulary in Korean and English. • Example Bank available with examples applicable to daily, real-life conversations and compositions. • Pronunciation guide from the built-in American Text To Speech (TTS) solution. • Various detailed examples essential for English learners provided. • When you enter a word to search, relevant sentence idioms and phrasal verbs are searched for and spelling is checked automatically. • Multiple types of searches are available in a single search window without the need to select a search mode. • Wildcard search: enter “?” or “*” in place of a letter when you are unsure of the spelling (e.g., “man*ver” retrieves the word “maneuver”). • Search not only for words, but for phrases or examples. • The spell check function corrects typos - if you are unsure of the spelling or mis-type a word, a list of similar words is offered. • With the Korean-English dictionary, you can quickly search a word by typing the initial consonants of the Korean alphabet. • The search results are listed in real-time when you enter a keyword. • links to Google so that you can search for more information on a particular word. • If you search for a verb in the English-Korean dictionary, the infinitive is always found whether it's in the present, past, past participle, or future perfect. • History menu lists all your recent word searches. • Save words and expressions to any number of flashcard folders. • You can efficiently learn the words saved in the folders using the Cradle and Yes/No Quizzes function. ***Electronic Dictionary Application Chosen by Top Smartphone Manufacturers, such as Samsung and LG. - Installed on over 90% of Samsung and LG smartphones with users all over the world. Highest market share for dictionary applications. *** The Number One Company in the Domestic Mobile Electronic Dictionary Market for Over 10 Years, with Over 100 staff in R&D. - The company”s own testing department performs meticulous testing, along with a customer support department. ***Diodict Dictionary Series, over 20 Different Dictionaries, Now Available on iTunes!